Dolly is one of the two horses that I currently own. She is a 2004 appendix mare. We purchased her in the summer of 2009. I am currently showing her on the quarter horse circuit in hunter under saddle. She has also recently added showmanship to her resume. Dolly is a very sweet horse with a great attitude and just all-around an awesome horse! Morgan is a 2002, appendix mare. I owned her for about 2 and a half years. 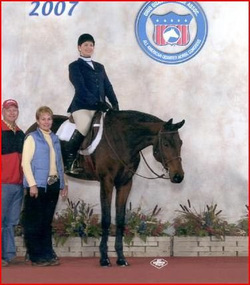 Her accomplishments include AQHA Congress 3 year - old hunter under saddle top 10, several all-around championships, circuit championships, and a 2X world show qualifier in Hunter Hack. She has accumulated 40.5 points in the open AQHA division, 133.5 in Amateur, 54 in Novice Amateur, 49 in Novice Youth, and 20.5 in youth, with over $4,500 in incentive fund money. She is a great all-around horse and has points in halter,showmanship, hunter under saddle, equitation, working hunter, hunter hack, equitation over fences, and western horsemanship. Morgan was the horse who pointed both my sister and I out of the novice division in both hunter under saddle and showmanship in very few shows. She is currently owned by Kellee Ferguson of Oklahoma. Gretchen is a half sister to Lola. We did not own her for very long since her true strength is in the hunter world, which I do not do myself. 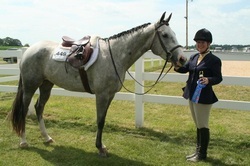 She now lives in Lacrosse, Wisconsin and is doing great with her new owner on the hunter circuit. Cole is a 2001, gelding by An Awesome Mister. He started off as my mom's Western Pleasure horse, which gradually became my Western Pleasure horse! In the end, not only was he a great western pleasure horse but also ended up being a great showmanship, horsemanship, equitation, and even hunter under saddle horse (At only 15.2hh). Cole earned 35 points with my mom and I. He also earned me my first circuit championship in Western Pleasure and was a great horse to start showing the quarter horse circuit with. He is now showing in Ohio. Rupert is definitely the horse I have the most memories with. 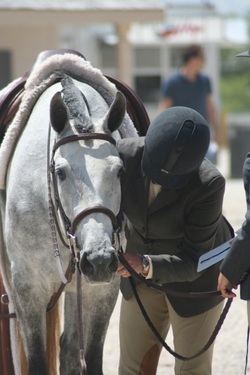 He was the first horse that turned me into a very competitive rider. When I got Rupert I was just starting to show at the nicer open shows, but was still also competing at some 4-H shows. He is truly a one-of-a-kind all-around horse. I have never seen a horse with so much personality as himself. Anywhere I would go, people would always recognize him as "Rupert", that horse with "the big dumb white blaze." Rupert carried me to several state top-tens, high-points and too many first places to count. This horse will for sure go down in my books as my favorite horse I have ever had the pleasure to own. He is currently owned by Emily Combs of Ripon,Wisconsin and still showing like an old pro!